Airports Council International (ACI) has released the latest edition of the World Airport Traffic Report covering over 2,200 airports in more than 160 countries. Passenger numbers increased by 5.7% in 2014, to over 6.7 billion. The global order is shifting, as airports in the Middle East and Asia continue their ascendance. Dubai finally took on the role of largest international airport in the world, even despite the closure of one of its two runways for some weeks. 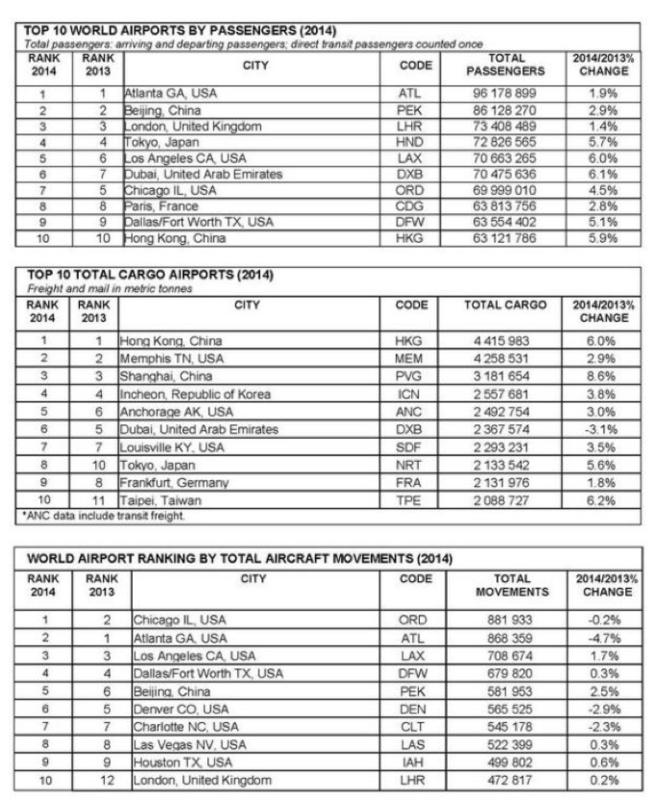 The top ten airports by passenger numbers, cargo and movements are listed below. Dubai (DXB) is the sixth-busiest airport in the world in terms of overall passenger traffic but it became the world's busiest in terms solely of international passenger traffic, ahead of Heathrow (LHR), in 2014. The world's top 30 airport cities handle more than a third of global passenger traffic. London is the world's largest airport system with almost 147 million passengers handled at six airports in and around the city-region(Heathrow; Gatwick; Stansted; Luton; City and Southend in diminishing order of size). New York maintains second place with 116 million passengers at three airports (J F Kennedy; Newark; La Guardia in diminishing order of size). There are other, smaller airports in the New York system – Stewart and Atlantic City - but they are not counted in this total. Tokyo is the third placed city market with 109 million passengers across the two main airports of Haneda and Narita. Again, the contribution of the small and distant LCC facility at Ibaraki is not counted. The rankings of the world’s busiest airports for 2014 may not look too different to the status quo of recent years, but growth rates hint at a continental shift in the airport powerhouses. Atlanta Hartsfield-Jackson International Airport (+1.9%) remained the world’s busiest airport in 2014 in terms of overall passenger numbers, based on CAPA’s airport traffic database but growth there is stagnating. It is the world’s leading hub but based around a small city; even in a bigger metropolitan area of around five million the immediate catchment area is comparatively small compared to those of Beijing, London, Tokyo and Los Angeles. Delta’s hub traffic, which takes up all seven concourses, is of critical importance. The airports rounding up the top three, Beijing (+2.9%) and London Heathrow (+1.4%) airports remained unchanged from 2013 rankings. Measured in terms of present day and future capacity though, they cannot be compared. While the British government still sits on a decision as to whether it should permit an extra runway at Heathrow (or somewhere else) sixty years after it was first mooted, Beijing’s under-construction Daxing International Airport, which will support the current Beijing Capital International Airport (BCIA), plans to commence work on its terminal building in Sep-2015. Indeed the existing BCIA has three runways while Atlanta has five. Moreover, the Atlanta city-region could well acquire a secondary airport (Paulding Northwest Atlanta); negotiations are ongoing. The world’s three busiest airports – located on three different continents – grew by an average of only 2% in 2014 but the next three largest airports (Tokyo Haneda, Los Angeles and Dubai) grew by an average of almost 6%. This suggests that if growth were to continue throughout 2015 at the same rates as 2014 those three airports would overhaul the capacity-constrained Heathrow, demoting it to sixth place in the global table. Tokyo Haneda (+5.9%) was the fourth largest airport in 2014, while Los Angeles (+6.0%) and Dubai (+6.1%) overtook Chicago O’Hare (+4.5%) to become the fifth and sixth busiest airports, respectively, with growth rates stronger than their larger competitor. Dubai, which surprisingly has only two runways like Heathrow, recorded its slowest growth in more than five years owing to a temporary closure of one of them in mid-2014. Typical aircraft size at Dubai is higher than its competitors (Emirates alone has 66 A380s in service with another 74 on order) so it can handle traffic on two runways). When the day comes that it can’t, the new Dubai World Central (Al Maktoum) airport, which is being expanded beyond its initial freight role, is ready. It is already taking increasing numbers of passenger flights. While it is common to compare Dubai with Abu Dhabi as powerhouse Middle East hubs, served by Emirates and Etihad respectively, it should be noted that Abu Dhabi remains significantly smaller than its neighbour and is yet to break the 20 million passengers per annum barrier despite its strong growth rate, which was 20.2%, to 19.9 million passengers, in 2014. In Japan, Haneda Airport has been expanding since a 2010 investment and increasingly hosts international traffic (17.2% of seats as of the first week of Sep-2015). It can handle up to 90 million passengers per annum without further infrastructure investment. Los Angeles International (LAX) is notable for having less connecting traffic than most of its peers in the US owing to its location; it is essentially an origin and destination (O&D) airport and is benefitting from the upturn in the US economy along with other similar sized facilities such as O’Hare, Dallas-Fort Worth (+5.1% in 2014) and New York JFK (+5.6%). JFK, the world’s 18th busiest airport, also counts as predominately an O&D airport while Dallas, the ninth busiest, is mainly a hub and O’Hare falls somewhere between the two. However, it should be noted that the Commission’s recommendations are strongly refuted by several airports and other organisations in and around London, led by Gatwick and London City airports, which both insist that insufficient account has been taken of the fact that over 70% of Heathrow’s passengers are O&D, and hence traffic that could be distributed amongst the other five metropolitan airports and beyond, which have spare capacity, thus removing the need for a third runway. As mentioned previously, Atlanta and Beijing have five and three runways respectively and Beijing will get its new airport as well by mid-2019. Meanwhile, of the three airports challenging Heathrow for that third place in the table – Tokyo Haneda, LAX and Dubai International – Haneda and LAX both have four runways. Another trend that stands out among the world’s largest airports is the relatively slow growth at Beijing Capital Airport in 2014 (+2.9%) as the Chinese economy started to stall. There has been a revival in 1H2015, with average growth of 6.7%, but as the Chinese stock market collapse has mainly taken place in 2H2015 it remains to be seen what effect will be felt by the aviation sector in the remainder of this year. At the same time, Shanghai Pudong Airport did report stronger passenger growth in 2014, with +9.5%, the second-best result in the league of top 20 airports. (Shanghai Hongqiao Airport grew by 6.7%). While it does not figure in the top 20, or even top 50, airports, one of the fastest growing in 2014 was Istanbul Sabiha Gokcen (+26.9%), moving up 23 spots in the ranking from 93rd to 70th ranked in 2014. Sabiha Gocken is a success story by any measure. During the previous year it averaged +26.7% (2013) passenger growth rate. While there was a slight dip in 1H2015 it was back up to 28.5% again in Jul-2015. Both Turkish Airlines (THY) and leading LCC Pegasus Airlines are flooding both the Istanbul airports with capacity. THY focuses on its hub operations at Ataturk Airport. Its more aggressive use of Sabiha Gokcen, the main home of Pegasus Airlines, was forced on it by the capacity constraints at Ataturk and its wish to continue with double digit growth. 100 THY aircraft will eventually be based there. The intention at Sabiha Gocken is that capacity will be increased to 32 million annual passengers with a USD20 million investment, including a satellite terminal. The government has also affirmed plans to add a second runway to support large aircraft including A380s. The biggest growth figure recorded in the top 20 airports was across the city at Istanbul Ataturk (+11.0%), moving from 18th to 13th ranked despite capacity constraints. Owing to these capacity issues, Istanbul has commenced the construction of a third airport in the north western part of Istanbul, currently scheduled to open in 2017 if that schedule can be kept on track. Phase I of the new airport will comprise three runways and three taxiways, with a 100 million passenger capacity terminal. It will accommodate around 150 million passengers per annum once fully operational. These enormous growth statistics are testimony to Turkey’s tourism pulling power and also to Turkish Airlines’ attempts to identify and promote Istanbul as another global centre for aviation. It is also a reflection of how Istanbul is catching up on the Gulf airports and benefits from having a sizeable local population (77.5 million) and a strong economy. The fastest growing airport in the Top 120 list was Bangkok Don Mueang with a growth rate of 30.7% (followed by a staggering 50% in 1H2015). Don Mueang, virtually written off five years ago in favour of the newer Suvarnabhumi Airport, continues to recover as a specialised low-cost facility, its value having eventually been recognised by Airports of Thailand and the government. In contrast, Bangkok Suvarnabhumi has been losing passengers, brought about by both economic and political factors. If that rate of respective decline/growth seen in 2014 were to continue, Don Mueang would, remarkably, overtake Suvarnabhumi in a little over two years, i.e. in 1Q2017. 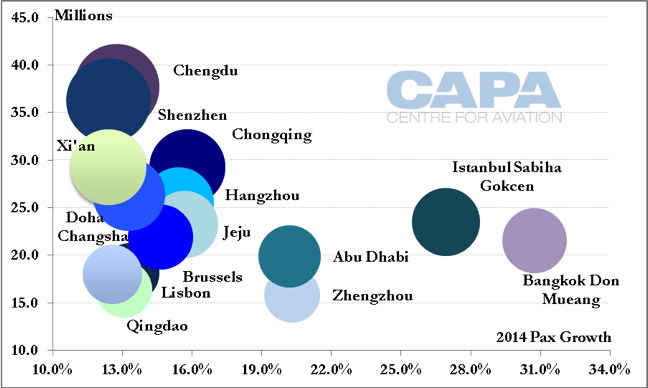 Other airports reporting strong double-digit growth were Zhengzhou (20.3%), Abu Dhabi (+20.2%) and Chongqing (+15.8%). A total of 22 airports recorded double-digit passenger growth in 2014, of which 14 were from Asia Pacific, including nine airports from China. Growth among the second-tier and smaller Chinese airports has been a trend that has emerged in recent years. And with these smaller airports, there is potential for significant growth, as these airports often serve cities whose populations easy surpass those at other metropolitan areas. 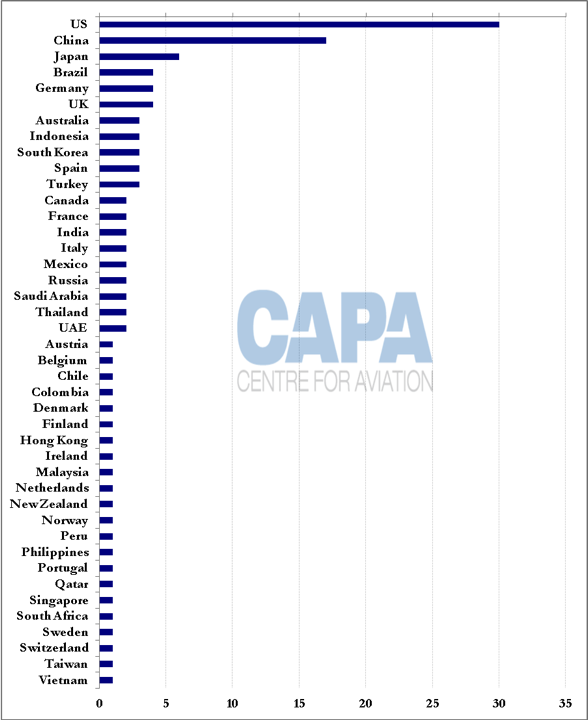 In 2014, China had the second largest number of airports among the top 120 globally with 17. The only new airport to enter the top 120 globally ranked airports was Zhengzhou (+20.3%), replacing Geneva (+5.0%), and moving from 127th to 118th ranked. Geneva fell from 120th to 123rd. European airports continued to be characterised by weak growth, indicative of economic conditions in the Euro zone, with growth at the major European airports remaining below 5%. Frankfurt and Paris Charles de Gaulle airports both failed to reach 3% growth. Brussels Airport and Lisbon Airport (which reported a record year for passenger traffic) were among the strongest growing airports in the continent (with growth of 14.6% and 13.3% respectively), with a major driver being the opening of new low-cost routes in each case. The US had the most airports among the top 120 globally, with 30 altogether, but the US has not constructed a new airport of real economic significance since Denver, two decades ago and, prior to that, Dallas-Fort Worth in 1974. With the number of passengers using US airports, many of which are already capacity constrained on the ground and/or in the air, set to increase by 90% between 2014 and 2034 according to one IATA forecast, the nation desperately needs new infrastructure. It is not coming in the form of new airports but there is at least USD100 billion going into projects at existing airports across the country, according to the CAPA Global Airport Construction database and some of this is at much needed locations like New York’s La Guardia Airport, Chicago O’Hare and Los Angeles LAX. In the US there were mixed traffic results for airports across the nation in 2014 while Latin American airports remain relatively small, despite the potential for growth - Latin America is expected to grow passenger numbers by 4.7%, serving a total of 605 million passengers, an additional 363 million passengers per annum. The growth percentage is at par with all other world regions except North America and Europe, where growth will be smaller. (During this period Brazil will increase passenger numbers by 170 million to 272 million, rising from 10th to 5th place globally). The small size of Latin American airports is emphasised by the fact that there are only three from the continent that are in the top 100: Brazil’s Sao Paulo Guarulhos, Mexico City and Bogota, Colombia. Sao Paulo’s growth (+9.9%) will be pleasing to a government that is committed to privatising its airports through concession agreements as it did here. Sao Paulo Guarulhos was in the first tranche and the third one is now under way. A new airport will be built in Mexico City and a complementary one in Bogota where the existing one is being expanded too, to handle 60 million ppa. There are investors, including some from Europe and the northern hemisphere generally that have been associated with Latin America for decades, but many have found the business and cultural environment difficult – including allegations of corruption within deal agreements, fluctuating economics, and unpredictable actions by governments such as Venezuela’s withholding of foreign currency transactions, trapping cash within that country. Or Bolivia’s re-nationalisation of three airports that were being operated by the Spanish conglomerate, Abertis. As a consequence interest in the region declined for a while in favour of others but it has been fired up again – the difference on this occasion is that home based investors as well as constructors are playing a significant role, either alone or in consortia. 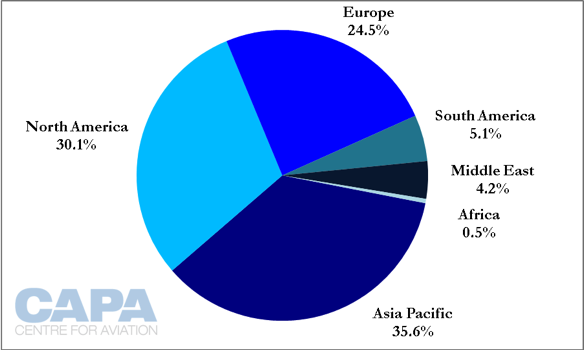 Among the top 120 ranked airports, Asia Pacific airports accounted for 35.6% of total passengers, followed by North America (30.1%), Europe (24.5%), South America (5.1%), Middle East (4.2%) and Africa (0.5%). However, 2014 saw a relatively poor growth performance by some Southeast Asian airports such as Singapore (+0.7%) and Jakarta (-4.8%). Southeast Asia was a tough market in 2014 due to overcapacity and unpredictable external factors such as the political instability in Thailand. Hong Kong performed better (+5.5%), supported by a stronger national carrier in Cathay Pacific, with further growth to be supported by the planned construction of an additional runway at the airport. (Cathay Pacific is the only Asian airline to have a presence in all three of Asia’s core long-haul markets: Australia, Europe and North America. The combined effect of rising demand for air travel and a strong demographic weighting have led many airports to experience exponential growth over the decade. China’s megacities that the world is already familiar with will probably continue to experience growth (perhaps except at Beijing Capital and Shanghai Hongqiao) that may be considered in China as “slow” but by all global measures is fast. The even faster growth will continue to occur at second- and third-tier cities, most of which rival or even exceed in size their global counterparts. The Chinese market is heavily domestic, and will remain so, but these smaller cities will gradually gain more international recognition, and growth. While the current economic slowdown may pose challenges, there is still tremendous potential. Elsewhere, the inaction on airport investment in countries such as the US and UK pose a very real risk of airports such as London Heathrow and some of the larger primary ones in the US being left behind, especially as compared to powerhouses such as Istanbul’s Sabiha Gokcen and Ataturk, and continuing growth at Bangkok Don Mueang, Abu Dhabi and Doha. So we have been, and will continue to do so, witnessing familiar levels of growth, but in unfamiliar places. 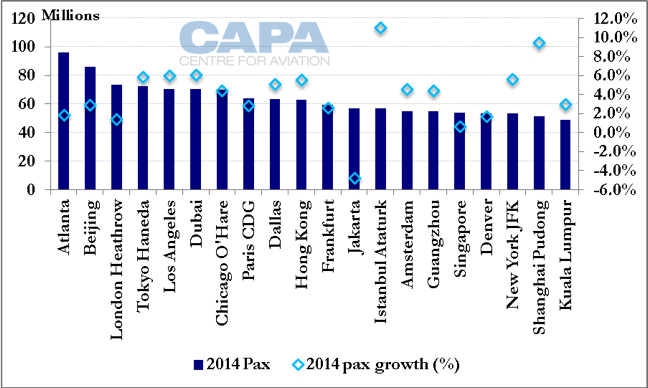 In the air cargo arena the average volume growth figure for the top 20 airports was 4.06% in 2014. Growth is slowing in 2015 as world trade weakens. China’s airports figure highly with 11% growth at Guangzhou, 8.6% at Shanghai and 6% at Hong Kong. Some of the usual high performers in this segment did not fare as well as usual, such as Seoul Incheon Airport, and Memphis, the global centre for the parcels business. In the top 20 table Chicago O’Hare was a surprise growth ‘champion’ at +12%; indicative perhaps of a manufacturing sector-led economic recovery in 2014.